SEA Games 2013 Opening Ceremony is scheduled to take place today, December 11, at the Wunna Theikdi Stadium in Myanmar, but there were already several sports events taking place in different venues in Myanmar since Dec. 4. Team Philippines so far has won 11 medals (3 gold, 5 silver and 3 bronze) in the 27th SEA Games ranking 6th as of last night, Dec. 10. Those 3 gold medals were won in the Wushu event, by Jessie Aligaga (Wushu Men 48 kg), Dembert Arcita (52 kg) and Daniel Parantac (Taijiquan + Taijijian). 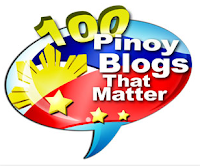 It was also in Wushu where the Philippine delegation won 3 silver and 2 bronze medals. 2 silver medals meanwhile were won in the Wrestling event and the remaining bronze came from the Canoeing event. PH's 11 MEDALISTS: Team Philippines so far has won 3 golds, 5 silvers and 3 bronzes. Above photo was from Evita Elise Zamora, who's one of the silver medalists. 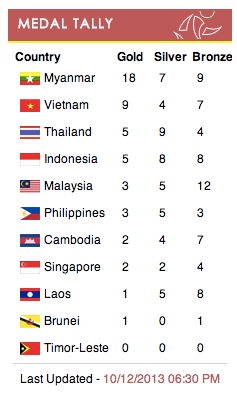 Here's an update on the 27th SEA Games Medals Tally, as of December 10, 2013, 12 midnight. Myanmar is enjoying homecourt advantage as it leads the ranking so far, just like the 2011 SEA Games in Indonesia, with the host country winning the most gold or medals. It's the opening ceremony today, and the only scheduled sports events taking place are Equestrian, Sepak Takraw and Shooting.